← I wish all atlases looked like this! 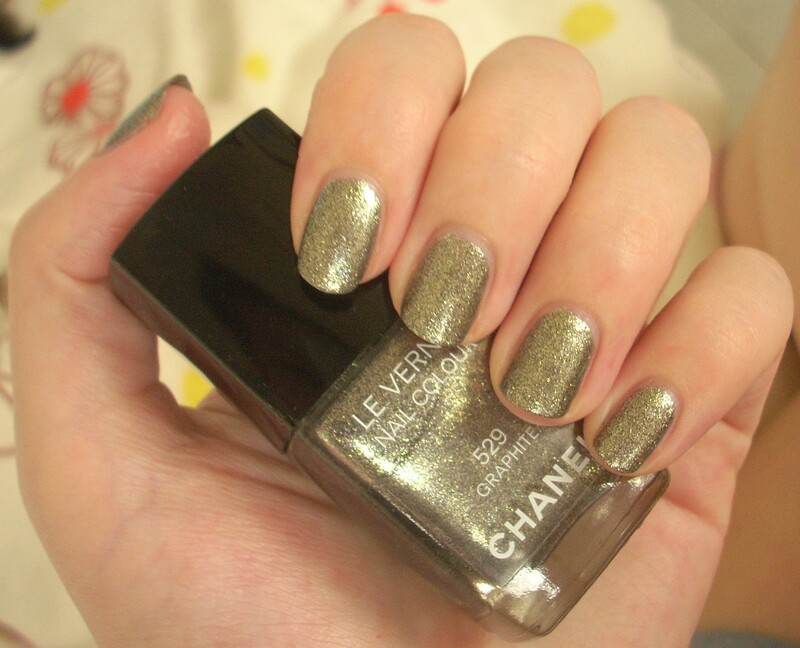 It’s been a while since I posted – but this is the perfect polish to break the rut… Chanel Graphite. 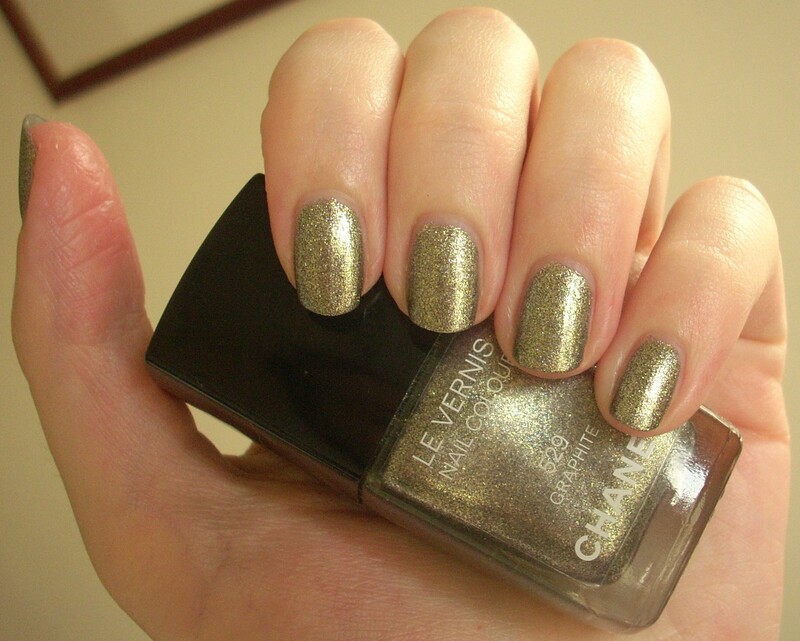 Oh, Le Vernis Graphite… j’adore. After using Graphite, my first Chanel polish, I was completed consumed by the desire to buy as many of their lacquers as possible, without care for cost or availability or anything else similarly level-headed – THAT is how good it was. However effusive I am in the rest of this review, trust me, it isn’t enough! Graphite is just amazing. I’ve seen lots of posts that make it look like a charcoal silver, which it most definitely isn’t. Instead, it’s a gorgeous glittering green gold, burnished blackened and utterly brilliant. In some lights, it flashes a shimmering silvery khaki but this dirty dazzling delicious fool’s gold is by far the more dominant colour. It’s simply a joy to behold and I make abslutely no apologies for the abundance of photos that follows as a result! The other amazing aspect of Graphite is its finish. It’s a cross between a foil and a glitter but is obviously neither and yet more than both put together. It looks amazingly textured but is totally smooth to the touch. It’s Extra Special in a way that words that also name an expensive supermarket ready-meal just cannot do justice to. In my collection, it’s also utterly breathtakingly unique. I was also blown away by the pure quality of it. I felt I didn’t need to do anything. It just flowed perfectly from the bottle to the brush and onto my fingernails in a neat perfect shape. I always hear the term on polish blogs ‘applied like butter’ and have never really had cause to use it – but this stuff really seemed to melt like magic onto my talons. For those not familiar with Chanel nail polishes, the chunky square cap lifts off to reveal a small round screw cap that allows better grip for application. The brush itself is slightly short but medium-sized in thickness and I encountered no problems with it whatsoever. However, by this stage, I was in such a state of general giddiness that the brush could have been starfish-shaped for all I’d have known – I just could not stop staring at my nails! If you look up images of graphite itself, it’s amazing to see how Chanel have managed to transform the mineral’s exact qualities and shading to a polish. It also reminded me of another mineral – pyrite, also known as fool’s gold – and the colour is just this wonderful textured mixture of gold, silver, green, charcoal and black, with shadows and shimmers in all the right places. It’s gorgeous from up-close, it’s gorgeous from far away… I imagine it would almost be gorgeous with your eyes shut too! It’s so glittery, it pretty much glows in the dark but despite it’s glitz factor, it absolutely never feels obtrusive, ostentatious or OTT. It also reminded me of a shimmering sheath of snakeskin – slinky, glitzy, totally divinely luxe. Wonderful colour, fabulous quality, a sense of sophistication, a luxurious glamour that’s still tasteful… It’s basically everything I ever hoped and expected from Chanel but had been afraid to believe was true. Well, it all was! 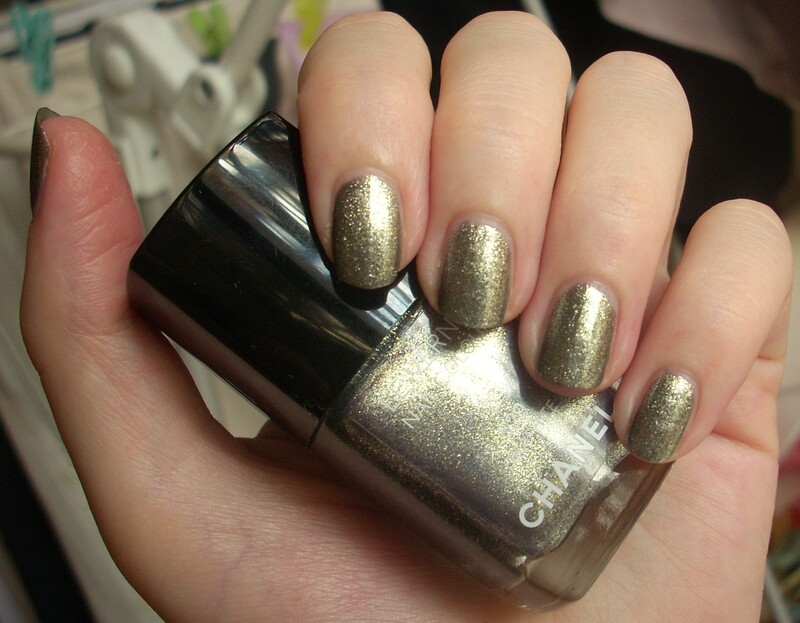 This entry was posted in Beauty and tagged Beauty, best glitter nail polishes, Chanel, cosmetics, favourite nail polish, gold, Graphite, Illusion D’Ombres Collection, le vernis, make-up, nail lacquer, nail polish, nail varnish, review, silver, swatch. Bookmark the permalink. They do look wonderfully smooth & light, & the glitter not overpowering. Chanel has amazing colours sometimes. 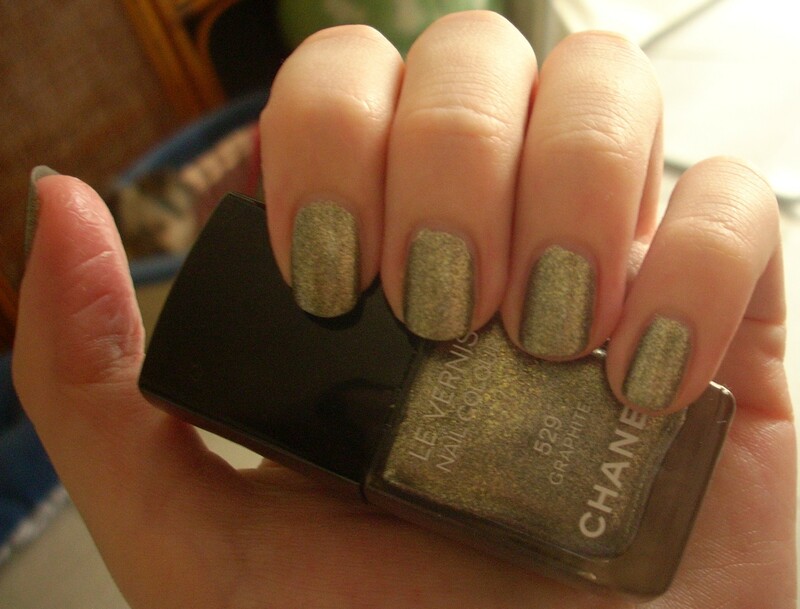 but my chanel colors never last as long as my opis! I love, love, love….did I mention love?! This colour! From the 3 released this past July, Graphite has me securely in its grip! I also think it looks drop-dead amazing on you (and your application skills need to be commended as well! ), but I can’t believe it’s your first Chanel!!! 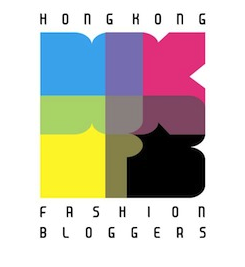 You are now officially bitten by the Chanel lacquer bug…there’s no going back, let me warn you…lol!!! Kudos! Yay! Eugenia! I feel so privileged you even dropped by to comment! GAH, I love Graphite so much, I majorly have the Chanel bug now, managed to get my mitts on Coco Blue (and borrowed Blue Boy) – you have any other recommendations, especially any from their permanent line? I can’t believe it’s taken me so long to reply *hangs head in shame*, but let me say how lucky you are to have snagged Coco Blue (and borrowed Blue Boy, lol! )…here in Canada, we were definitely snubbed (guess us Canadians aren’t a big enough force in the beauty world, or what exactly? lol!). For the record, while Chanel polishes are AMAZING, they don’t apply themselves, so YOU take all the credit for this one (you’re a natural!!!) My recommendations? Well, it depends on what colours you lean towards, but their reds are awesome (check out Dragon, and if you like some shimmer, their limited edition one out now Rouge Carat, is like Dragon but with very subtle shimmer), or if you can still find Peridot, I’d say grab it, as it’s not only limited, but so incredibly unique in my opinion. Let me know if you need anything else! Hugs! I looove this polish!! it’s seriously one of my favs! Thanks for the comment Eva – glad to hear Graphite has another fan! 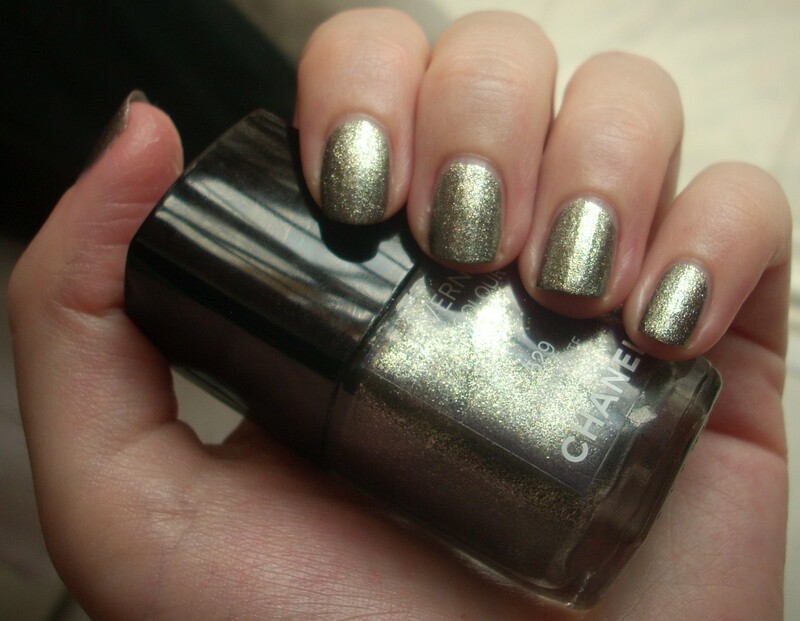 have you tried other Chanel colors? I’m looking for a reddish pink and was wondering if you had any suggestions. I have tried a few other Chanels, but mainly their more weird and wonderful colours! Can I suggest you check out Eugenia’s blog http://ommorphiabeautybar.com as she’s got loads of great Chanel polishes reviewed in depth there!